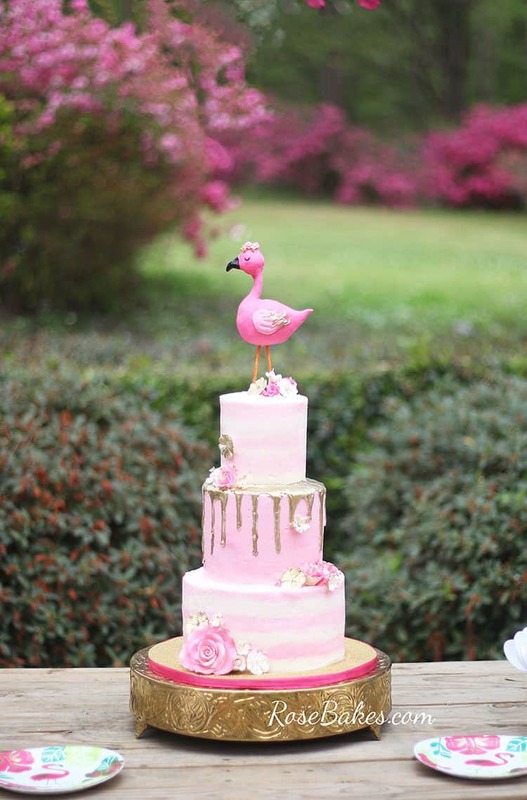 This Pink & Gold Flamingo Cake is a perfect spring or summer cake design for a Flamingo Party! 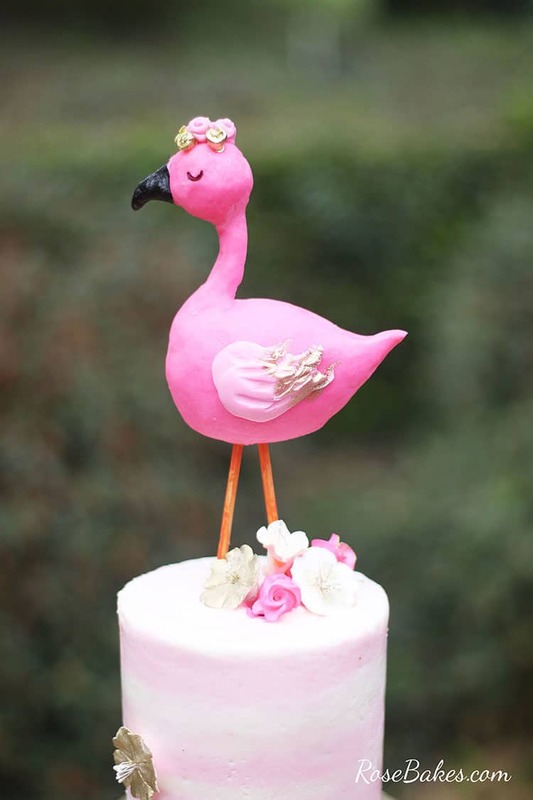 I’m also including an (impromptu) Flamingo Cake Topper Tutorial video. Last week was a blur. I even missed writing my weekly newsletter last Saturday. Why? 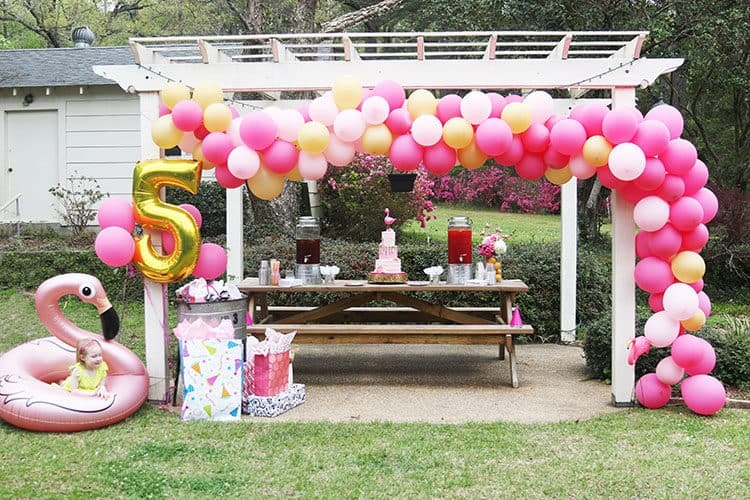 Well… I was busy, busy, busy preparing for and hosting my niece Perry’s 5th birthday party! Quite honestly, it didn’t occur to me until Monday (I think it was) that I’d even forgotten the newsletter. The thing is, I absolutely love hosting parties. Love, love, LOVE it. 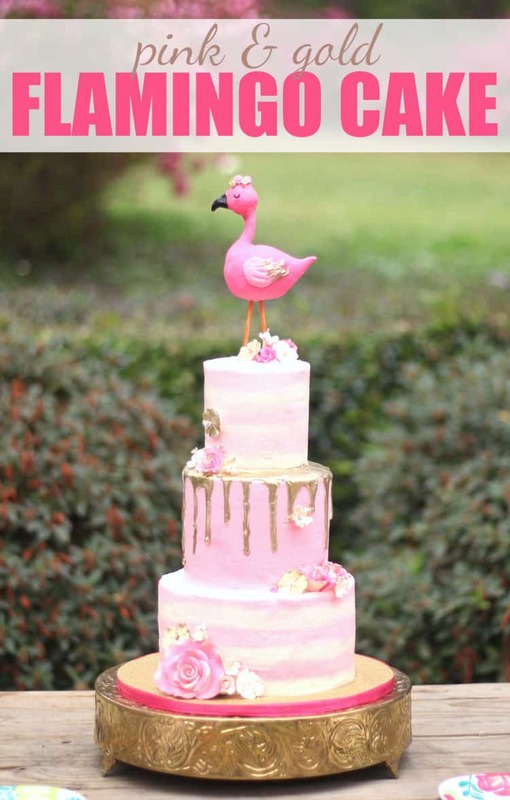 Our backyard is perfect for things like this and it was ideal for the Flamingo themed party! In fact, one reason we were so thrilled to buy this beautiful big property is so we could have people over all the time. But as much as I love it – this Mommy was exhausted by the time the weekend ended. Thanks goodness my sister-in-law and her Mom were doing the party decorating and all the other food or I’d have been a complete failure. And speaking of decorating… they did a fantastic job!! What about that balloon display huh?? Let me back up and say I did have some cake work done.. the cake was baked. It was 4″, 6″‘ and 8″ tiers of this strawberry cake. And thanks to help from Sarah, the tiers were filled and crumb-coated. But decorated? No. As of Saturday morning at 9am, I had not done a single thing as far as decorating the Flamingo Cake. I hadn’t even made a topper and I knew I wanted a 3-D flamingo topper. So what’s a girl to do? Throw it into high-gear and get busy, that’s what! First, I had to decide on a design and run with it. For the sake of time and ease, I decided on an (almost) all-buttercream cake. The week before I’d done the yellow striped buttercream cake (seen here) and I wanted to try a different technique to get the stripes, so that was my top and bottom tier. 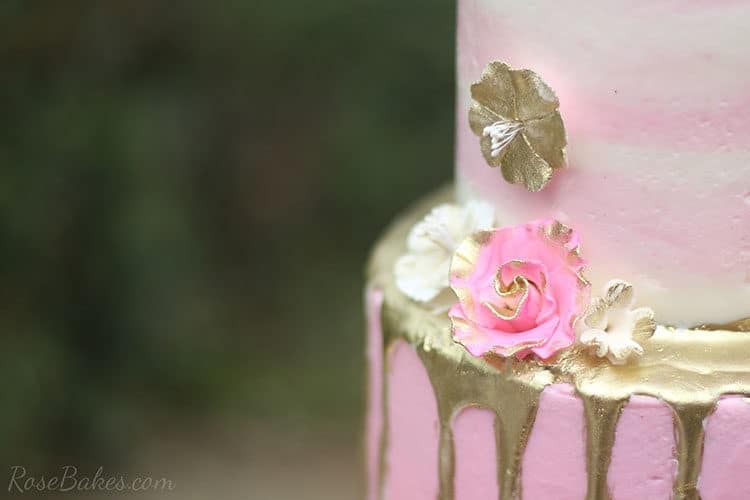 Gold drip was added to the solid pink middle tier (although it was a little runnier than I prefer and melted easily) – and painted some of the flowers gold. I also used Wilton Colormist to spray some of the flowers pink and voila! – I was almost done. Doing all of that took about an hour. Lastly, I had to get a topper on the cake. Since modeling chocolate is the easiest medium to work with when you need something ready to use quickly, I decided to make the flamingo out of pink modeling chocolate. Actually, I had decided about the modeling chocolate first thing that morning (when I was in panic mode) so I made it first and let it be setting up in the fridge while I decorated the cake. By the time the cake was decorated, the modeling chocolate was ready to work with. 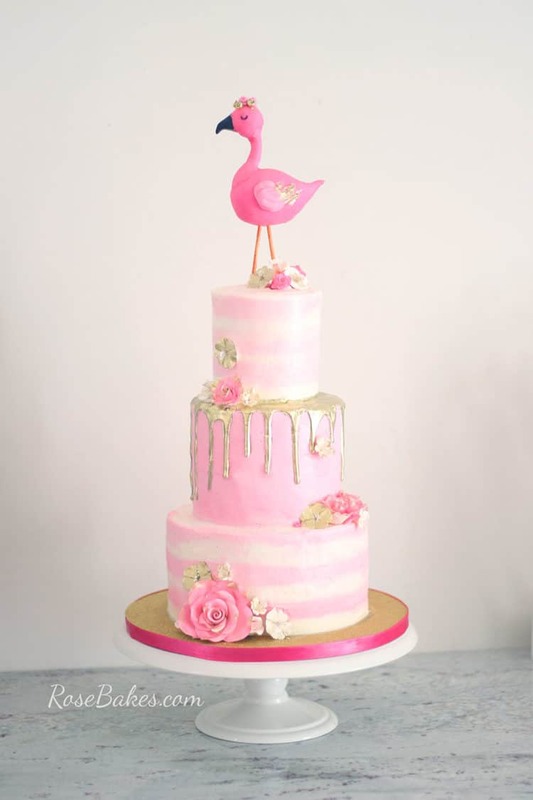 After sharing the Flamingo Cake Topper on Facebook, several of you asked for a tutorial, so I actually made a second flamingo on live video. In the end, it was not quite as cute as the first, but you can definitely get the gist of how to make it. You can find a little info on the video here in my Facebook group. The short version is, video is way outside my comfort zone and I’m well-aware that it’s far from perfect, but if it helps some of you, then my job is done! Alrighty – I’m going to share some information about the cake and then we’ll wrap this up!! The cake was 4″, 6″ and 8″ tiers of the best strawberry cake. The tiers were baked in my favorite Magic Line pans. 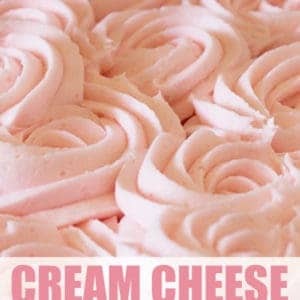 It was covered and decorated with cream cheese buttercream. I used Americolor Electric Pink to color the pink frosting. The flowers were all gum paste – purchased from Wholesale Sugar Flowers. The drip was melted candy melts, painted gold. I mixed Gold Luster Dust with Lemon Extract to make the paint. 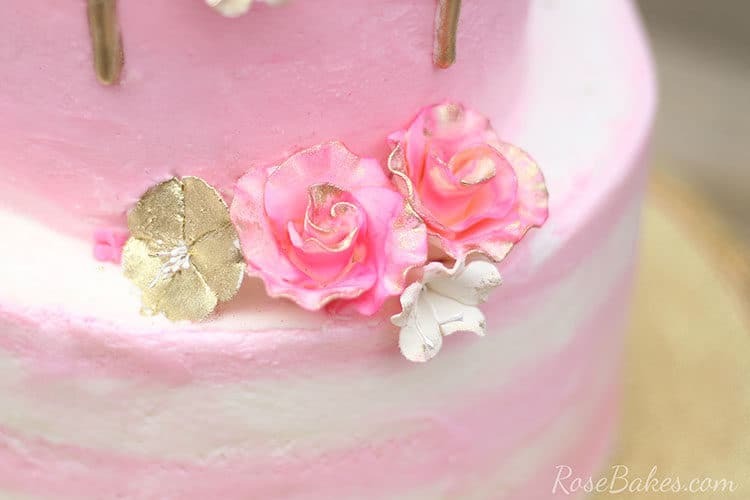 I used the same Gold Paint for the flowers along with Wilton Colormist (Pink) to spray some of them. Okay – that’s all I’ve got for you! If you have questions, leave me a comment below! I absolutely LOVE the details on this party, and the cake is perfect! Thank you for sharing!! Would love details on the balloon arch.